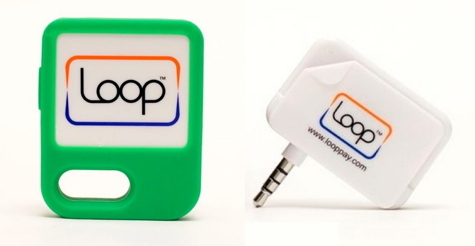 LoopPay’s Fob provides a way to wirelessly transmit your credit card information to a payment terminal. Just hold the Fob close to the slot where you would normally swipe your card and press its button. Transaction complete. The tech world has been rife with predictions about how, in the not-too-distant future, we’ll be able to dispense with our credit cards and buy things with our smartphones instead. The Loop Fob brings us several steps closer to that goal. The Fob can contain your credit cards, your loyalty cards, your membership cards, and your ID cards. The Fob is presently an iPhone accessory. An Android version is in the works. First, the free Loop Wallet app must be downloaded before the device can be used. The Fob plugs into your iPhone via the 3.5mm audio socket and contains a built-in magnetic card reader. To begin set-up, you plug in your Fob, open the app and create a PIN. You set up your cards by swiping them through the slot on the Fob and follow the onscreen prompts. Optionally, you can sign a card onscreen so that you can show it to a clerk if requested. Your data is encrypted and tokenized for security. The Fob charges with a provided USB cable. A charge will power 300 transactions. Whenever the Fob is held in contact or very near a typical magnetic stripe payment terminal during a transaction, the payment information is transmitted when the button is pressed. For additional security, you can set the Fob button via the iPhone app to work for ten minutes, eight hours or, indefinitely. As an example, if you are going shopping on a Saturday, you might set the Fob to be active for the day. Then whenever you are checking out, your Fob will handle the transaction for you. After that day it will not work without connecting it to your iPhone and using your PIN. 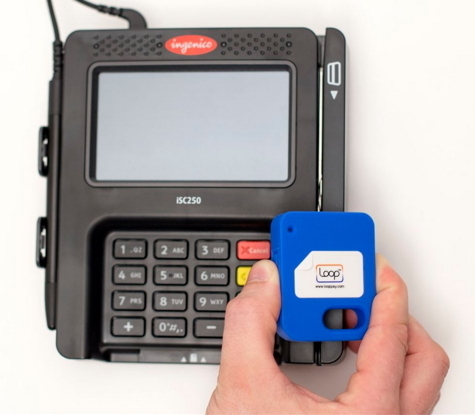 Loop’s induction technology that transmits data wirelessly to a payment terminal could be a game changer. The Fob works with 90% of the existing card readers already in retail stores. Credit cards with embedded EMV chips that are used by most countries outside the USA are more secure but require a different card reader. Changing all of our millions of retail terminals will take years and be prohibitively expensive for many merchants. Instead, Loop’s technology permits using the existing hardware. Presently, there are a couple of downsides. First, the Fob is another device that must be carried around with you. It’s only a couple of inches square, but it’s still another thing to remember to bring with you. Loop has just revealed a new Charge Case ($99.00) that adds the Fob’s features to a case that contains your iPhone. That way, you only have to remember your phone when you go shopping. The other gorilla-in-the-room is security. There are those who are paranoid about their privacy and committing their sensitive credit card and other data to a device that could be lost or stolen is not even up for consideration. Loop’s careful security precautions, PINs, timers, encryption, passwords, etc, help, but this whole concept will put those people off. If you are technically competent and and have confidence in Loop Fob’s security, this device looks like the dawn of a functional, personal electronic payment system. I have used my Fob in many retail locations and it has worked flawlessly each time. Store clerks are always amazed and frequently comment on the wizardry. It’s not exactly an old-school leather wallet replacement, but it’s close.